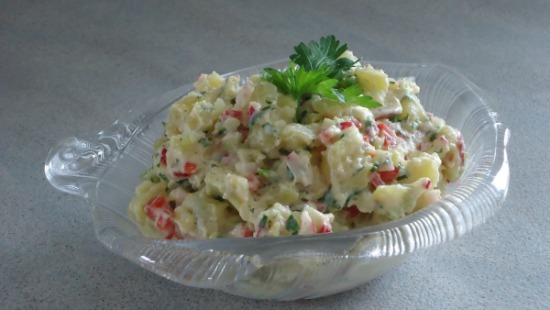 This potato salad recipe is a big hit in the summer time. We make it often in the warmer months as it’s handy for picnics, entertaining and a great quick meal the kids can scoop out for themselves on busier days. Place the potatoes into a large pot and cover them in water (about 1-2 inches higher than the potatoes) and add two teaspoons of salt. This adds a little extra flavor to the potatoes. Bring the water to a boil and then reduce to a simmer until cooked. Potatoes can take anywhere between 10 – 25 minutes to cook depending on their size. If you have smaller potatoes check to see if they are cooked even after 10 minutes. A good way to check them is by piercing one in the middle with a fork. It’s important not to overcook them or the salad will be mushy. Once cooked drain the water and rinse them with cold water. Then remove them to a plate and set them aside until they cool off just enough so they can be handled. The peel comes off better when they are warm to the touch. Once peeled and cooled cut the potatoes into cubes (the size you would enjoy eating) and place them into a large bowl. When all the vegetables are washed take the onions, celery, radishes and red bell pepper and chop them up very fine (nice and small). I know it’s a sixties style, but these small sized veggies really add a special texture to the salad. These little moisture filled tid bits of veggies add a special crunch to this potato salad recipe. It’s probably because they are so small and there are so many of them that they coat the potatoes better offering that little extra yum. Well we love that about this salad and quite honestly, I think that’s why our guests (okay and us too) always go back for seconds. In a smaller bowl place these finely chopped veggies along with the parsley, dill and mayonnaise. Now add salt and pepper to taste and mix well. Let this mixture sit for about 10 – 15 minutes as this helps add a little extra flavor and moisture to the salad without using more mayo. This meal is healthy but doesn’t rank high on the list for dietary meals, but it’s nice to enjoy a bowl of it now and then and it’s truly an amazing dish for entertaining. This is probably because this salad taste a little bit better the day after you make which is a huge plus to make something the day before you entertain and have it taste even better the day of. So if you’re gonna be a little bad, be bad with something that’s so good.